This opinion piece contains spoilers for Riverdale Seasons 1 and 2. On paper, Riverdale’s Cheryl Blossom is basically a walking stereotype. She’s a Mean Girl trope, a Regina George wannabe who not only rules Riverdale High, but who makes life miserable for our designated heroes. Her expensive clothes, dramatic makeup and outsize attitude clearly mark her as an enemy, the embodiment of every socially awkward teen’s worst nightmare. Every high school has a Cheryl, after all. As viewers, we’re theoretically supposed to mistrust her, to root for her downfall, to see her as something less than the wholesome foursome at Riverdale’s center: Superjock Archie and overachiever Betty, rebellious Jughead and bad-but-not-that-bad girl Veronica. We know right from the series’ first episode who Cheryl Blossom is supposed to be. Or do we? The beauty of Riverdale is that it’s a teen drama that delights in subverting every possible trope within its own genre as often and aggressively as possible. (None of its heroes are actually that heroic, after all.) So it makes sense that Cheryl doesn’t entirely fit into her predetermined stereotype of the catty, misogynistic girl whose greatest talents are chasing boys and putting down other women. Sure, her one-liners are legendary and her comebacks are savage, but her carefully crafted HBIC persona hides a deeply complex, emotionally layered personality underneath. Tortured heroes like Archie’s conflicted football star or Jughead’s struggling writer are fairly common on television, but characters like Cheryl – a flawed mean girl publicly grieving the loss of her closest family member while struggling to figure out who she really is – are not. Despite the fact that she wasn’t exactly a member of the series’ “core four” friend group, Cheryl was nevertheless a key piece of the narrative in Riverdale Season 1. Her open and emotional connection to Jason was a large part of the reason viewers cared about his death in the first place. (It’s not like the show’s first season did a whole lot to help us get to know him, after all.) And as the mystery surrounding her brother’s murder deepened, we saw Cheryl grieve for Jason; grapple with the revelation that he wasn’t exactly the town golden boy; discover her own father was responsible for his death and attempt suicide as a result. Let’s be honest: That’s more of a defined character arc than Jughead got in Riverdale’s first season. No matter what happened to Cheryl in Season 1, it still felt like her character grew from those experiences, whether by learning about her history, reevaluating her own needs, or realizing that she is capable of more than she previously thought possible. We saw Cheryl repeatedly reject her pre-determined Blossom family destiny, often choosing kindness and friendship in spite of her prickly outward persona. Season 1 ended with Cheryl literally setting fire to her own past in order to forge a new life for herself, smiling all the while. It was a stunning, powerful image – and one that left fans eager to see where the show would take Riverdale’s Queen Bee in Season 2. Which is why her story in the drama’s sophomore season has largely been such a disappointment. Though the Season 1 finale set up a pretty significant power shift within the Blossom family and the town itself, Cheryl is largely absent from huge chunks of Riverdale Season 2. Occasionally she shows up to drop a GIF-able one-liner, snipe at her terrible mother, or flaunt a particularly amazing outfit. But her arc has largely been nonexistent, despite the multiple plot threads left hanging from last season. The hinted mother-daughter story between Cheryl and Penelope largely failed to materialize, her tentative friendships with Betty and Veronica generally fizzled, and her crush on Josie rapidly devolved into a creepy stalker plot that suddenly ended with no real explanation or resolution. There were entire episodes where Cheryl barely appeared or – worse – was onscreen, but had no lines at all. Yes, there’s a certain level of enjoyment to be found in watching Cheryl torture her mother over their newfound poverty, or make snide remarks about how Penelope has turned Thistlehouse into a brothel. But that’s not the same thing as a real story, and Cheryl deserves the chance to do more than generate sassy one-liners for Riverdale recap writers. The only real bright spot for Cheryl in Season 2 has involved her exploration of her sexual identity, which eventually led to her coming out as bisexual. Her burgeoning relationship with newcomer and Southside Serpent gang member Toni is charming and sweet. Yet, even that storyline has often felt rushed or truncated, crammed into a handful of episodes when it should have been a season-long arc. (The less we ever mention the Josie-stalking story again, the better.) Surely Cheryl’s journey to self-acceptance deserved at least as much screentime as Jughead’s membership in his father’s motorcycle gang? Instead, we pretty much went straight from a single heartfelt conversation at Pops to gay conversion therapy camp, as Cheryl’s mother had her committed and Toni was forced to stage an elaborate rescue of a girl she clearly liked but barely knew. 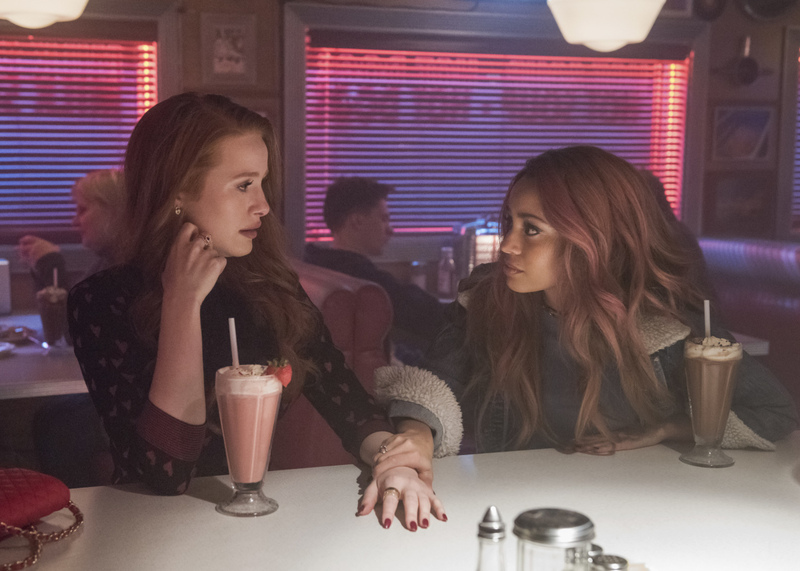 And while Madelaine Petsch’s performance has been singularly wonderful throughout, it’s difficult not to wonder how much better this storyline might have been had it gotten any time to breathe or develop properly (and if it didn’t seem as though Toni was originally brought on as a wedge to cause trouble for Betty and Jughead rather than as a love interest for Cheryl). Yes, Riverdale is a completely bananas show, and one that’s generally not concerned with drawn out or even necessarily cohesive plot points. Things happen in this town at breakneck speed and different characters necessarily rotate in and out of the spotlight on a week-to-week basis. However, a character like Cheryl, who was such an important part of Season 1 and who has been through so much in her own right, needs to be treated as more than an afterthought. The series’ musical episode “A Night to Remember” is a perfect reminder of how much the show benefits from giving Cheryl a starring role. She delivers her turn as Carrie with a fierce, personal determination and ends the episode on her own terms, covered in pig’s blood and demanding emancipation from her mother while striking an instantly iconic pose. (Honestly, no other character on Riverdale could have ever pulled any of this off.) Cheryl Blossom at her best is a girl who not only manages to survive the most Gothic of horrors, but grow from them, with style. And despite her overall lack of screentime this season, she’s still one of the most interesting characters on the show. It time for Riverdale to embrace that fact, rather than use Cheryl’s presence to push other narratives forward. She not only deserves that much – quite frankly, she’s earned it. Riverdale airs Wednesdays at 8 p.m. ET/PT on The CW in the US, and streams weekly on Netflix internationally.